Recently, my partner and I were visiting his mother in Long Island. While we were there, I suggested we go into the city so that I could check out this store, Moo Shoes, that sells vegan shoes (for men and women) and related apparel (e.g., vegan belts and wallets). We put our jackets on, drove to the train station, jumped on the LIRR, and headed into Penn Station. All the while, my partner kept complaining about having to go all the way into the city for, of all things, naugahyde shoes. As I'm telling him to zip it, I'm thinking to myself: God, I hope we didn't just blow an entire afternoon going into the city for some naugahyde shoes. Moo Shoes is located at 78 Orchid Street. 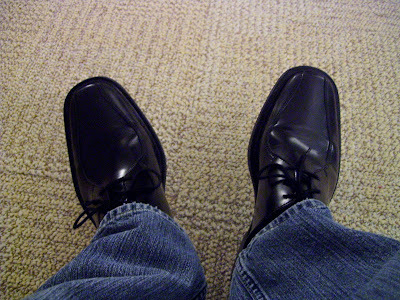 I bought a pair of "Kent Klarke" shoes for $119, which are not made of non-breathable naugahyde or "pleather." (Shoes that do not breathe would not work for me in D.C., especially during the humid summers.) Instead, the shoes are made of a breathable microfiber that really does act like leather. They bend and scratch like leather and can be polished and buffed like leather. I have been wearing them for a couple of weeks now. They feel comfortable and well made. I couldn't be happier! How long did these last? Would you say they were tough? They were/are Naughahyde?